With the recently released state budget for 2018, the Western Australian Construction industry has welcome the budget changes with caution, following pledges to maximise jobs, whilst warning of a potential 500 billion dollar shortfall in transport infrastructure spending. “The Government’s big infrastructure program should help ensure a better year for our industry, civil construction, and contribute to a greater sense of optimism and stronger economic and employment outcomes,” Mr Miller said. “However, there’s again a question mark over just how much of the billions promised on road and rail in the coming financial year will be spent. As I warned in September last year when the 2017/18 Budget was released, Governments tend to overpromise and under deliver when it comes to transport infrastructure spending. 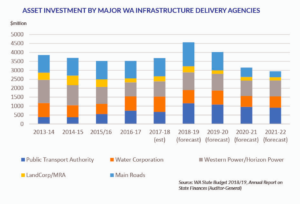 “A look at the asset investment plans of the major transport project delivery agencies shows their actual spending on projects this financial year will be around $600 million less than was forecast in last year’s Budget. Mr Miller said some of the ways this could be achieved included ensuring our hard-working transport agencies have adequate resources to manage their project delivery workload and packaging projects into smaller contracts that can be brought to the market quicker (including early works packages that will provide more opportunities for local contractors). “We absolutely applaud the Premier’s ongoing commitment to maximising local employment opportunities on infrastructure projects,” he said. “To ensure the best jobs outcome, however, projects need to be structured in such a way that stimulates the local contracting industry, by providing a broad mix of opportunities for contractors of all sizes. “Already with METRONET, we’re hearing concerns from locally-based companies that they will be denied opportunities if the projects are bundled into packages designed to suit the big consortiums. Mr. Miller said the establishment of Infrastructure WA, an initiative of this State Government, was a milestone in infrastructure planning that would result in greater certainty in project delivery. “We welcome the Budget allocation of $15.3 million in funding for IWA,” he said.